07.13.13, More than 2,000 people affiliated with the Israeli branch of the Islamic Movement held a pro-Morsi demonstration in the Arab town of Kafr Kanna on Saturday. 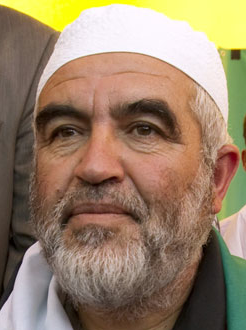 The protesters were led by the movement’s leader Raed Salah. They held pictures of ousted Egyptian president Mohamed Morsi and blocked the town’s main road. “Morsi is head of state, we oppose the army, we oppose the revolution,” Arab-Israelis chanted in a rare show of support for Egypt’s Muslim Brotherhood. Protesters also shouted that they would be willing to give their life for Morsi. The focus of the protest’s anger was directed against Egypt’s Defense Minister and Chief of Staff General Abdel Fattah al-Sisi, who decided to depose Morsi nine days ago in the wake of massive public protests. The protest was organized by the Islamic Movement’s northern branch. The movement’s leader, Sheikh Raed Salah, and his deputy Sheikh Kamal Khatib took an active role in the protest. In May 2003, Salah was arrested along with other Northern Islamic Movement officials on suspicion of transferring funds to Hamas under the pretense of humanitarian aid. He was released after two years under the terms of a plea bargain. In August 2007, Salah was indicted for “inciting racism and violence” for calling for a “third Intifada,” or uprising, to defend the Al-Aqsa mosque and in 2008 Israeli security forces raided the offices of the Islamic Movement in northern Israel accusing it of aiding Hamas. In 2009, Salah said that Israel had a ‘diabolical plan” to cause the Al–Aqsa Mosque to collapse “in a way that would appear as is happening as a result of natural causes, such an earthquake.” In January 2010, Salah was convicted of assaulting an Israeli policeman and participating in a violent demonstration. In April 2012, Mr Salah won an appeal against a deportation order issued by the UK where he had been residing on the basis that his presence “would not be conducive to the public good”. Mr.Salah had been arrested in 2011 after he was allowed to enter the country despite being banned on the basis of “virulent anti-Semitism”. In September of 2012, Mr. Salah predicted that Israel actions toward the Al-Aqsa Mosque will “speed up the demise of the Zionist entity” and deliver the West from “Global Zionism.” In March 2013, Mr Salah warned U.S. President Obama not to visit the Al-Aqsa mosque during his upcoming visit to Israel. Supporters of the sheikh insist he is opposed to all forms of racism. Sheikh Salah’s Islamic Movement is reported to have mourned the death of Osama Bin Laden, calling him a “martyr” and his killers “Satanic”. While British law entitles such a view to be expressed, it could weigh as a factor in denying entry to a non-British citizen. Conspiracy theory Another consideration may have been an article that Sheikh Salah wrote three weeks after the 9/11 attacks, in which he said that unlike Muslim workers in the World Trade Center, Jewish workers had been absent on 9/11. ”Were 4,000 Jewish clerks absent by chance, or was there another reason?” he asked, alluding to a conspiracy theory that is still advanced by some extreme groups that the Israeli secret service Mossad – not al-Qaeda – was behind the attack that killed nearly 3,000 people. Although similar 9/11 conspiracy theories have been found to be not uncommon within some Islamist groups in Britain, this could also have counted against Sheikh Salah. He is also reported to have made a speech in February 2007 during a protest in East Jerusalem in which he accused Jews of using children’s blood to bake bread. A MEMRI report also describes Mr. Salahs history of extremist views. Knowledgable sources report that Salah is currently residing in Israel.